The more you learn, the more you’ll earn! AbdurRazaq Abdul-Aziz shows us how to succeed without having a “good” sponsor or upline. And also, the potential of building a business in Africa. 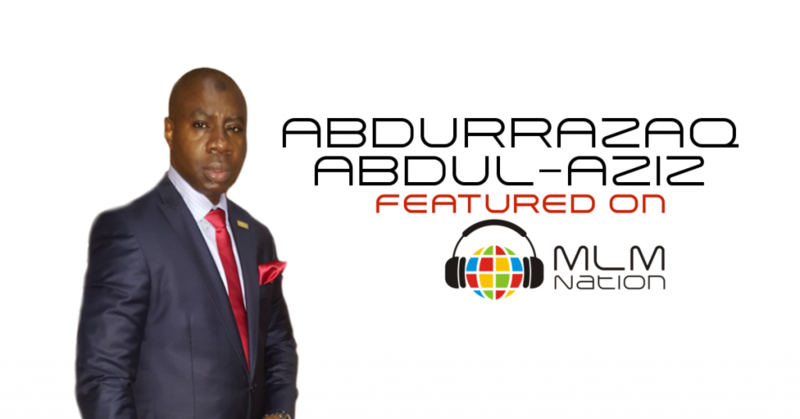 AbdurRazaq Abdul-Aziz was working to expand his family cleaning business when he first came across network marketing. At the time the cleaning business was struggling and he needed money but when someone first approached him about MLM, he was negative about the profession. He had already made up his mind that he wasn’t going to join because he had heard negative things before. But out of respect for his friend, he decided to listen and after hearing his friend and doing his due diligence, AbdurRazaq realized that everything about MLM was the exact opposite of what he had heard before so he got started. In his current company, Abdur-Razaq has broken numerous records. He set the record for earning over $10,000 a month in just five months and then hit $25,000 two months later. He earned over $100,000 in his first year. He’s won numerous of other awards such as the 2014 Corporate Recognition Award, the 2016 President’s Cup, etc. and also given a prepaid luxury car. His company's products are his biggest prospecting tool.